The George Washington and Jefferson National Forests are combined United States National Forests that form one of the largest areas of public land in the Eastern United States. The forests cover 1.8 million acres (7,300 km²) of land in the Appalachian Mountains of Virginia, West Virginia, and Kentucky. The forest extends along the entire length of the Blue Ridge Mountains and the Allegheny Mountains south to the North Carolina border. The northern portion of the Blue Ridge Parkway extends through the Forests. More than one-third of the forest is actively used for timber harvesting, the bulk of which is used for furniture manufacture and pulp for paper products. Approximately one million acres (4,000 km²) of the forest are remote and undeveloped and 89,862 acres (363.66 km²) have been designated as wilderness areas, eliminating future development. More than 2,000 miles (3,000 km) of hiking trails including the Appalachian Trail go through the forest. The forests are also home to more than 500 various species of plants and trees. 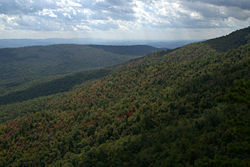 The Shenandoah National Forest was established by the United States government in 1926. In 1933 the Natural Bridge National Forest was added to the Shenandoah and on June 28, 1936 the name was changed to George Washington National Forest. The Jefferson National Forest was established in April 1936, from parts of Unaka National Forest, George Washington Forest south of the James River, and additional lands. The two forests were administratively combined in 1995. They are separated by the James River. George Washington National Forest is situated north of the river and the Jefferson National Forest is south. The forests are popular destinations for hiking, camping, mountain biking, hunting, and fishing. Deer, wild turkeys, bear, and other wildlife once hunted almost to extinction have recovered their numbers in protected habitats within the forests and are once again thriving. Fish are plentiful in the forests streams and lakes. Map showing the location of the George Washington and Jefferson National Forests. White Rocks Little Sluice Mountain. Virginia's highest point, Mount Rogers, is located in the Mount Rogers National Recreation Area, which is part of the forest. 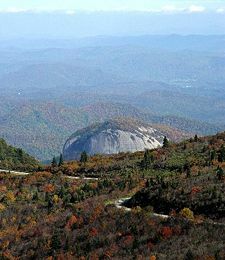 Other notable mountains include Elliott Knob, which has one of the last remaining fire lookout towers in the eastern U.S., and White Top Mountain. Jefferson National Forest is located in 22 separate counties, more than any other National Forest except Mark Twain National Forest in Missouri, which lies in 29 counties. George Washington National Forest has a total area of 1,065,389 acres (1,664.7 sq mi, or 4,311.5 km²). There are local ranger district offices located in Bridgewater, Covington, Edinburg, Hot Springs, and Staunton. Jefferson National Forest has a total area of 723,350 acres (1,130.2 sq mi, or 2,927.3 km²). There are local ranger district offices located in Blacksburg, Marion, Natural Bridge, New Castle, and Wise. There are over 500 species of trees and plants and the forest is dominated by various species of oaks and hickories, with maples and pines also common. The American black bear is common enough that there is a short hunting season to prevent overpopulation. White-tailed deer, bobcat, bald eagles, weasel, otter, and marten are also known to inhabit the forest. The streams and lakes in the forests contain bass as well as brook, brown, and rainbow trout. Starting in the early 1900s, an ecological catastrophe hit the forests of southwestern Virginia. By the mid 1930s, a fast-spreading introduced fungus, the chestnut blight, had virtually eliminated the American chestnut, so highly prized for its timber value and its abundant crop of nuts used by both man and wildlife. Before the blight, in some parts of the Forest, the chestnut was the dominant tree, accounting for up to 70 percent of the total number of trees in some stands. Blue Ridge Parkway in autumn near Looking Glass Rock. Pilot Mountain as seen from Virginia. 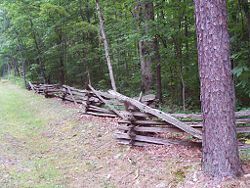 As more people moved into western Virginia, the settlers often viewed the forests as land that had to be cleared for more fields. The mountain lands, though eroded and overcultivated, were still desired by outside mining and timber interests. In the 1820s the combination of iron and trees to feed the iron furnaces made mining a profitable venture in many areas near the Shenandoah Valley. Repeated cuttings cleared the mountains, erosion caused streams to become clogged with silt, and floods came more frequently and caused greater damage. Perhaps the most insidious effect of industry was wildfire, which burned repeatedly over the mountains. Miners, timber operators, and hunters pushed animal species like elk, white-tailed deer, and wild turkey to the brink of extinction. Only the discovery of large deposits of higher-quality iron ore in the Great Lakes States ended the demand for Virginia iron. These are the heaviest and most beautiful hardwood forests of the continent. In them, species from East and West, from North and South, mingle in a growth of unparalleled richness and variety. They contain many species of first commercial value and furnish important supplies which cannot be obtained from any other region. … The preservation of these forests is imperative. … Their management under practical and conservative forestry will sustain and increase the resources of this region and of the Nation at large. A small group of forest reformers introduced bills in Congress to protect the nation's forests. In 1891, the Forest Reserve Act was passed that authorized the creation of Forest Reserves, the forerunner of what was to become the National Forest system. In 1902, the state legislature of Virginia passed a resolution expressing support for the establishment of an extensive national forest in Virginia and in the southern Appalachians. With this resolution, the state granted the federal government the right to acquire "Forest Reserve" land and at the same time relinquished its right to tax these lands once they became National Forests. Support for establishing National Forests in the southern Appalachians came from the private sector as well. In 1902, the National Lumber Manufacturers Association threw its support behind the idea, and in 1905 the American Forestry Association also endorsed creation of National Forests in the Appalachians. The battle in Congress took almost 10 years, but finally, in 1911, President William Howard Taft signed the Weeks Law authorizing the purchase of deforested land to protect it for watershed purposes. In 1911, 13,450 acres of land was bought from Douglas Land Company in the Whitetop "Purchase Unit" in what is now the Mount Rogers National Recreation Area in far southwestern Virginia. Nine years later, in 1920, this purchase would be combined with other newly acquired lands in Tennessee and North Carolina to form the Unaka National Forest. In 1913, 29,000 acres from the Glenwood Estate became the first addition to the Natural Bridge Purchase Unit in the southern Shenandoah Valley. Three years later this tract was designated the Natural Bridge National Forest. In 1934 and 1935, the Clinch and Mountain Lake Purchase Units were created. Finally on April 21, 1936, Franklin Delano Roosevelt created the Jefferson National Forest out of lands formerly contained in the Unaka and Natural Bridge National Forests, and the Clinch and Mountain Lake Purchase Units. At a dedication ceremony held on July 1, 1937, Under-Secretary of Agriculture M.W. Wilson noted that "President Roosevelt has named it the Jefferson. This is fitting, for Thomas Jefferson was a practical conservationist, and this National Forest embraces much of the country he knew and loved. He knew that man's welfare depended in large part on use of natural resources." To control erosion and floods … as sources of inspiration and recreation, they foster spiritual, cultural and other values essential to mankind. As a living resource they can be renewed … producing continuous crops for harvest. Forests help stabilize industries and communities and add to man's physical welfare … [providing] … the greatest good to the greatest number in the long run. In 1917, three northern Virginia units were combined to become the Shenandoah National Forest, later renamed the George Washington National Forest to avoid confusion with the National Park bearing the same name. The Civilian Conservation Corps (CCC) also played an important role in the early days of the Forest Service. The first CCC camp in the nation, Camp Roosevelt, was located in the George Washington National Forest. A total of 14 camps were eventually opened on the Forest's lands. The CCC employed 9,200 men in Virginia during the nine years of the program's existence. Their work is still evident today in the roads, campgrounds, picnic shelters, fire towers, and other projects scattered throughout the Forest. Between 1945 and 1956, the number of visitors to some areas increased as much as four times. With its proximity to Washington, D.C., and Richmond, Virginia, George Washington National Forest has always been a popular destination for those who enjoy outdoor recreation. By 1938, most large and small game had been nearly wiped out due to over-harvesting and habitat destruction. That year, the Virginia Commission of Game and Inland Fisheries and the National Forests in Virginia entered into the first cooperative agreement of its kind in the nation. Under this agreement, the two agencies would work closely together to restore wildlife habitat and begin the process of rebuilding huntable game populations on National Forest land. This partnership served as a national model for many other National Forests across the country. In 1960, the Multiple-use Sustained-Yield Act was passed by Congress. It stated that national forests shall be administered for outdoor recreation, watershed, range, timber, and wildlife purposes. A wildlife management agreement with the Virginia Department of Game and Inland Fisheries has helped to reestablish turkey, bear, deer, and many other species that were nearly driven to extinction due to unregulated hunting and poor land management practices during the late 1800s. The Threatened and Endangered Species Act of 1973 has also served to protect wildlife and their habitat. The forests are popular hiking, camping, mountain biking, hunting, and fishing destinations. The Appalachian Trail extends for 330 miles (530 km) from the southern end of Shenandoah National Park through the forest and along the Blue Ridge Parkway. The forest is within a two-hour drive for more than 10 million people and receives heavy visitation, especially in the region closest to Shenandoah National Park. Swimming is available in several mountain lakes. Both primitive and developed campgrounds are located throughout the forests. The George Washington National Forest is a popular destination for trail runners. It is the location for several Ultramarathons, including the Massanutten Mountain Trails 100 miler, the Old Dominion 100 miler, and the Old Dominion Memorial 100 miler. Other activities available include hawk watching, cross-country skiing, horseback riding, nature photography, and orienteering. “An Appalachian Forest: Creation of the Jefferson National Forest and its Effects on the Local Community.” Forest and Conservation History. 37:4 (October 1993): 169-178. Davis, Richard C. September 29, 2005. 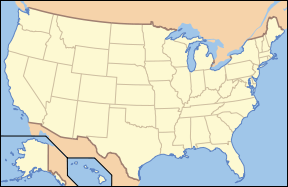 National Forests of the United States. The Forest History Society. Retrieved November 2, 2008. “Fisheries and Wildlife Management: Part of the History of the Jefferson National Forest.” Virginia Forests. 48:2 (Summer 1992): 6-8. “Green Cove Station: An Appalachian Train Depot and Its Community.” Virginia Cavalcade. 42:2 (Autumn 1992): 52-61. “Prehistoric Southwest Virginia: Aboriginal Occupation, Land Use, and Environmental Worldview.” Smithfield Review. 5 (April 2000): 125-151. Run100s. 100 mile endurance runs. Retrieved October 31, 2008. “The Great Anti-Fire Campaign,” American Forests. 99:5&6 (May/June 1993): 33-35, 58. “The Mount Rogers National Recreation Area and the Rise of Public Involvement in Forest Service Planning.” Environmental History Review. 28 (Summer 1994): 41-65. “The Potts Valley Branch Railroad and Tri-State Incline Lumber Operation in West Virginia and Virginia, 1892-1932.” West Virginia History. 54 (1995): 42-58. “Turnpike Tourism in Western Virginia,” Virginia Cavalcade. 48:1 (Winter 1998): 14-23. US Forest Service. 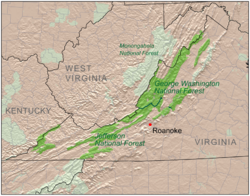 George Washington and Jefferson National Forests. Retrieved October 31, 2008. History of "George Washington and Jefferson National Forests"
This page was last modified on 2 December 2008, at 20:36.